Over the years I’ve heard from so many of you about reaching the end of one of my books, and not wanting to say goodbye. There were so many times I also wanted the stories to continue. 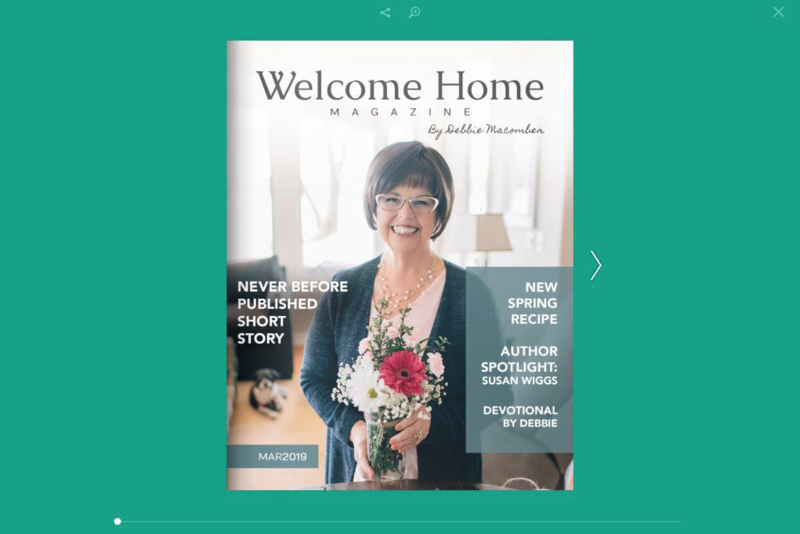 I still have so many stories to tell, characters to develop, and locations to revisit and I want to share them here with you in this special new digital magazine format- Welcome Home. I can say without reservation that a great deal of love, talent, and passion went into this project and I hope that when you dive into it, you find yourself right at home. Check out a preview of the magazine below and use the links to purchase the magazine. Make sure to check for an email confirmation from FlipSnack that will include a receipt as well as a link to start reading! Make sure to tell your friends and other fans of Debbie about the magazine! Not seeing what you're looking for? Try our FAQ section below. 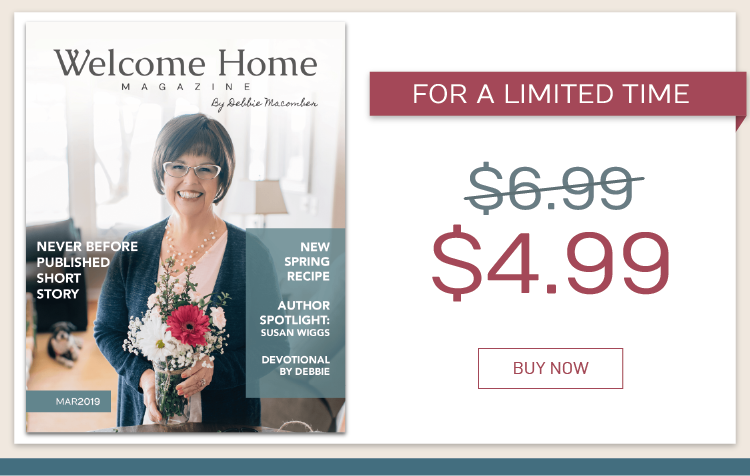 Once you’ve clicked on the link to purchase your edition of Welcome Home, you will be prompted to pay for the issue. 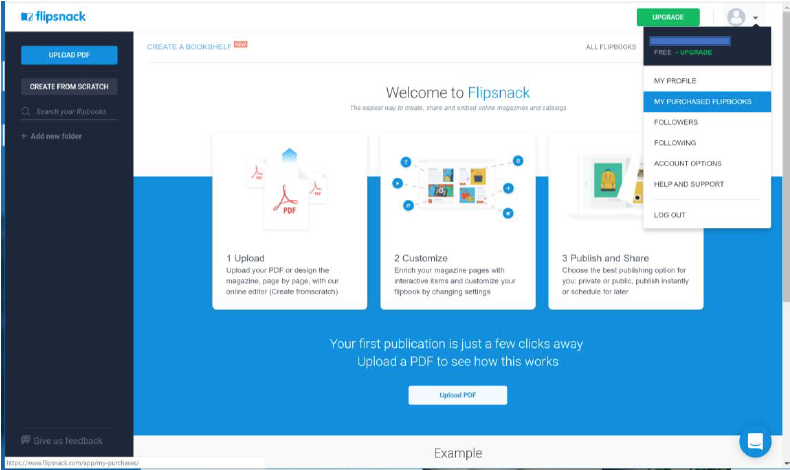 Flipsnack creates an account for you and you can immediately begin viewing your magazine. Before you exit, be sure to finish setting up your account using account options under the dropdown. This will allow you to come back and view purchased issues. 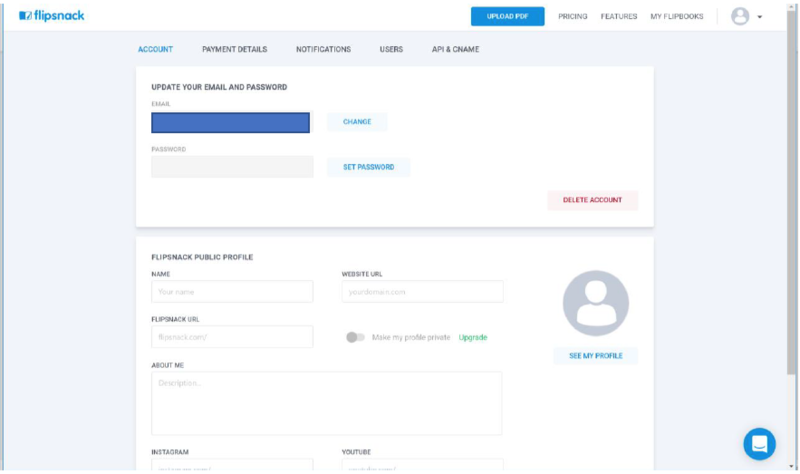 Once you click through to account options it will use your email that you entered to make your purchase and ask you to create a profile and password. 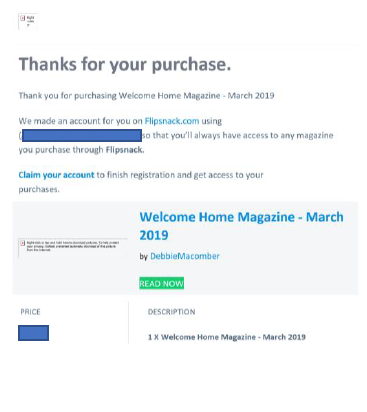 Don’t worry you will also receive an email from flipsnack in case you miss this process and need to go back in to set up your account or read your magazine. Once you make your purchase you may begin reading! Click start reading to begin! 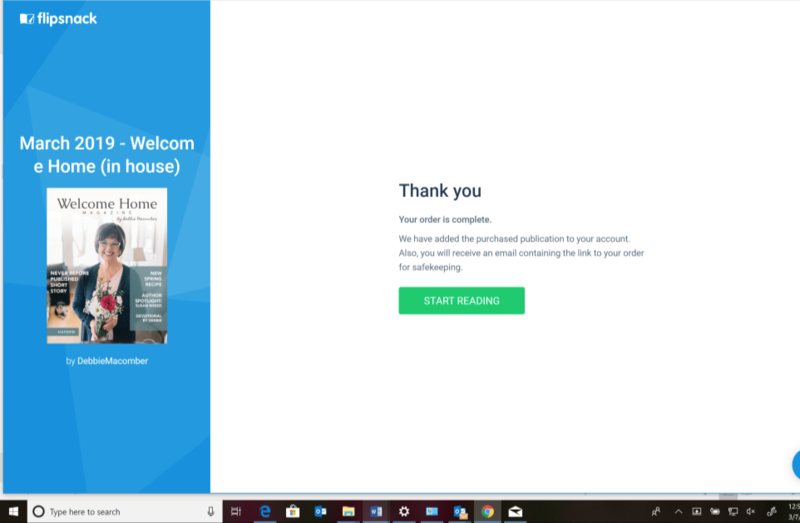 When you return to flipsnack.com to read or re-read your magazine, you will need to sign in to your account. Once signed in, you can click on your profile icon in the top right corner of the screen and select, “My Purchased Flipbooks”. 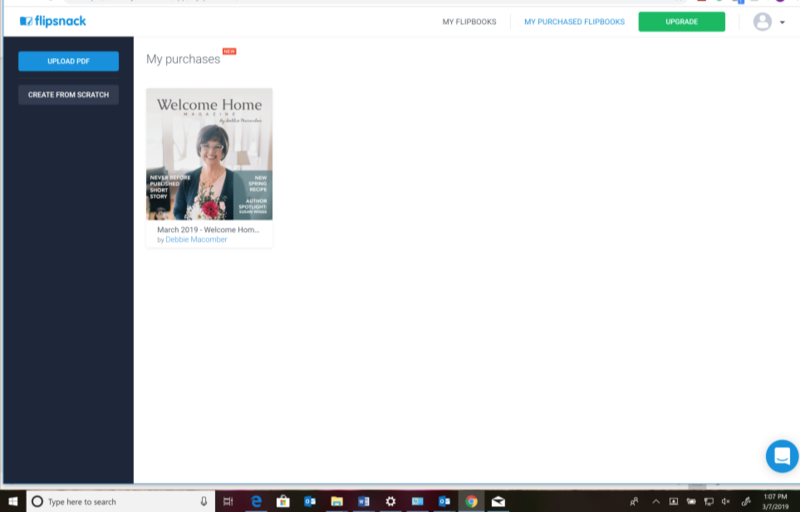 This will give you access to read all of your purchased content. Does the magazine come in a paper copy? No, this is a digital magazine only. Is $4.99 a monthly cost for the magazine? Is there a subscription option for the magazine? No, currently there is no subscription price or yearly payment option for the magazine. How often will the magazine be published? Currently, we are planning to publish one magazine per month. Do we have to purchase each magazine individually vs. an annual subscription at a reduced price? Will future editions cost $6.99? We plan on continuing to add more and more content to each magazine. So the price of the magazine may increase, but for now it is only $4.99. Is there a way to get the magazine on my Kindle or Nook? No, our magazine is hosted through FlipSnack, so there isn’t a way to download it to your Kindle or Nook. No, currently PayPal is not an accepted payment method with FlipSnack. Can I buy multiple copies of the same magazine under the same email address to “gift” to a friend? 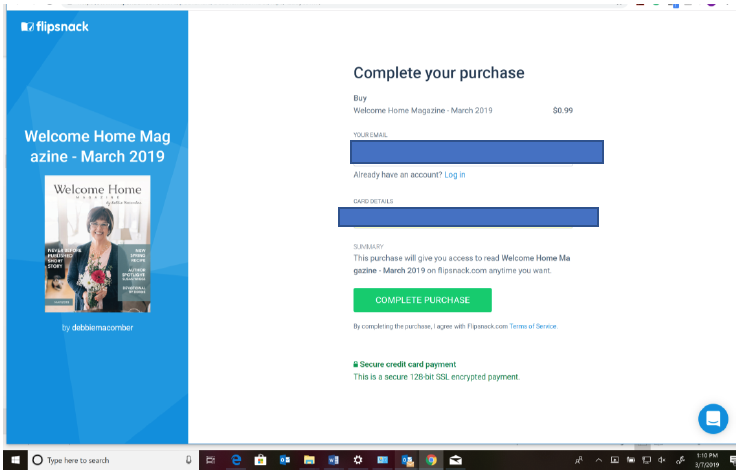 No, currently FlipSnack doesn’t support buying multiple copies of one magazine under the same email address. © Debbie Macomber. All Rights Reserved.